Finally the global-tide is turning on Predatory Finance. The Troika and Vulture Capitalism have always been nothing but an empty shell with no constituency to serve: Except their artificially created trillions in fake debt worldwide. The crimes committed against the people of Europe have always been about the money, the bankers and those that have facilitated this entire charade upon the world. The needs of the people of the world have been abused and ignored in this process to the point of global-extinction and that is what is about to change. What the vote made clear two days ago to the EU was that “the only thing that matters now is the continued survival of the people”. That would be those who have been saddled with paying 100% of the so-called global-debt for the last 15 years. What they received in return for their penury is more debt, more poverty, more starvation and death for their forced compliance. The EU, the IMF and their criminal friends have attempted to demand full compliance and even deeper ‘Austerity measures’, as the price for the continued existence of the Greek people ­ with zero consideration for anything that’s needed for survival over the last five years - during which time the Greeks’ continued to pay and pay and pay for their own slavery. That vote two days ago, spit directly in the face of the creatures that run the economic weapon which supposedly was an EU instrument of control for the member states in the EU and elsewhere: The appointed ones’ used 90% of the fake money to enrich their individual lives. By voting an overwhelming “NO” to their terms for continuance ­ what the Greeks were able to do was to force the criminal and fake-financial-forces, into submission - to the fact that the people of the EU have never been a part of any of their decisions, since January 1, 1958. 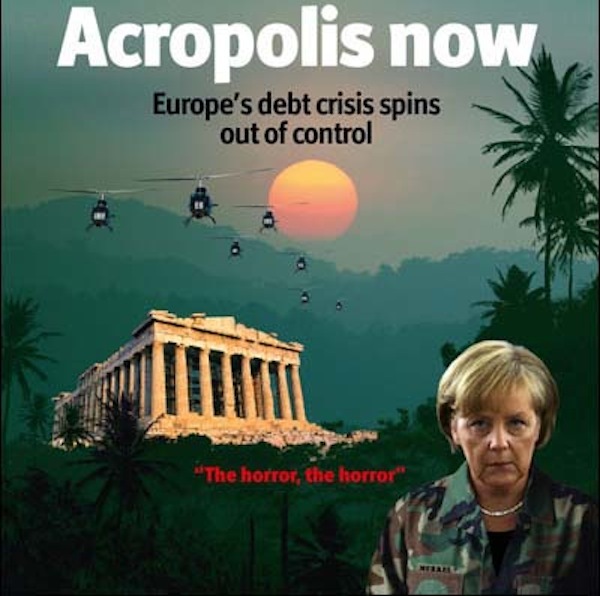 And because the Greek Finance Minister forced that issue - the entire edifice of corruption had to finally blink. Were appointed, not elected by anyone. They’re all just a bunch of criminally directed puppets! None of them were ever real. Unfortunately what did turn out to be a problem was the massive DEBT that the ‘authorities’ say that every person in the EU is still responsible for, even though the people only get 10% of the artificially-created “money”, while they are RESPONSIBLE for 100% of the “debt”. It was this fake equation that finally turned the public tide in Greece and elsewhere against the banks and all those that have been hiding behind the fake institutions that began about the same time ­ just after WWII. The Catch 22 that made the Greek Voter Rebellion valid; is something that unfortunately far too few people have ever been aware of. Beginning at 128minutes 32 secs: “Once again the head of the snake is the financial system which translates to private control of the issuance of debt-based money. It is this system of power that corrupts every aspect of human society. Nonetheless it is fragile because it inherently requires our consent. Here’s more on the man who replaced Varoufakis; the finance minister with ‘eyes of fire’ who literally scared the hell out of the established outlaws in charge of hijacking all the nations in the EU. “Steeped in left-wing politics, Tsakalotos has been a sharp critic of austerity. Addressing the Sinn Féin Ardfheis in March, Mr Tsakalotos said Syriza, Sinn Féin and Spain’s Podemos were “part of a great realignment in European politics”. A personal comment - the interaction with Sinn Féin gives Euclid a very interesting depth on politics, which in my independent view, might be potentially overlooked. All in all there has been a titanic shift in the direction of reality. The Greeks have demanded official recognition and rejected abject slavery outright. What this means for all of us, is that finally some have officially recognized and demanded real changes in the status of those who have been saddled with 100% of all illegal ‘debts’ worldwide: While simultaneously getting almost nothing for their torture, poverty and death, which the Banksters have felt completely free to impose - just because they could.